So what gives you a headache? 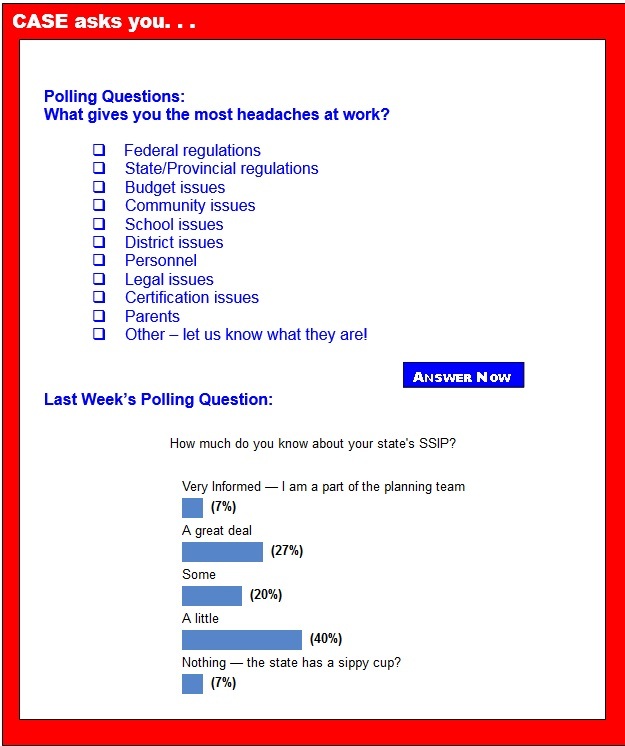 This week's polling question asks that question. We need to know that answer so CASE can, if possible, help you find the right resources to either eliminate or at least ameliorate the pain! If you don't see your headache producer listed, would you take the time to either email me or go on Facebook and start a discussion about it? We try to address as many of those "headache" producers by making sure you have the most up-to-date information as possible. We get that information to you through this email, our Facebook page, our website, our quarterly newsletter and our bi-annual Journal. We also get this content to your through our conferences and other professional development opportunities! Over the years, the headache producers change. One that is maybe not as quite as big as in the early years but still one we all would most likely put in the top 10 is legal! CASE has had an attorney article in our quarterly newsletter for 12 years and our very first webinar years ago was by an attorney and our most successful webinars were always on a legal issue. The CASE spotlight session at the CEC convention has been by Julie Weatherly, Esq. for the last 8 years at least and is always one of the most well attended session of all the CEC sessions each year. So often the best way to stay out of legal trouble is by taking preventative steps and the very best one is to make sure everyone understands the legal requirements! For that reason, we are devoting an entire day to legal issues at our 4th Annual Hybrid Conference. Julie Weatherly will be joined by Denise Lowell-Britt (AZ). Julie will start the day with a 90 minute update and then we will have a time of questions and conversation. Then Denise will address LRE, Transition, Dispute Resolution and then Julie will discuss Student discipline (suspension/expulsion), Parent involvement, and Child Find. Surely these six topics are ones everyone at the school and district level need to hear! So often the very persons who need to get a refresher course are the ones who can't get away. By being a virtual site, your assistant principals and others will be much more likely to get the information they need! Hopefully decreasing your likelihood of one more headache! State Performance Plan/Annual Performance Reports, which measures results and compliance. States are currently developing State Systematic Improvement Plans, designed to improve outcomes in targeted areas. Differentiated monitoring and support for all states, but especially low performing states." There are seven core principles for RDA. You can click here for the full version of those principles. This topic will be a major focus of our 4th Annual Hybrid conference. 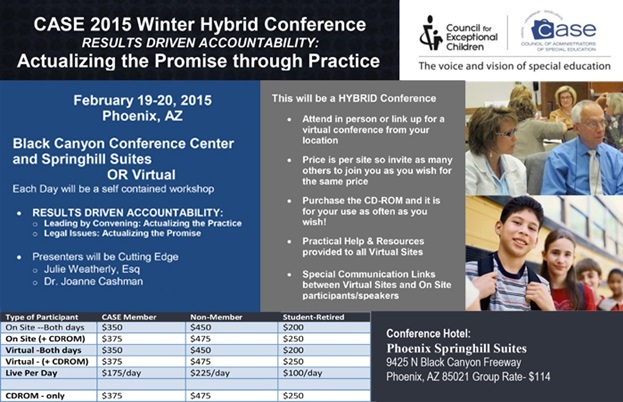 Seems like many of us need to be making plans to participate in this conference either in Phoenix or as a virtual site! For more information, go to the CASE website or look at the article below! Today is the last day for the CEC early bird registration! Will you be attending the CEC Conference in San Diego, California, April 8-12? Have you registered? If not, the early bird rate is still available but only until Jan. 26. And remember to be sure you plan your trip to arrive in time to attend the CASE membership meeting starting with breakfast, sponsored by Scholastic, on Wednesday, April 8! Also, we are so excited about the amazing CASE Night we have planned this year — Dinner at the world famous San Diego Zoo! Sponsors, Star Autism, C8 Sciences and VizZle, have outdone themselves with this great event. We believe this event will sell out so be sure to mark your calendar for Feb. 1 when the ticket go on sale on the CASE website! Julie Weatherly will be doing our spotlight session again this year. Watch for all the great CASE events at CEC in the weeks ahead! Survey | Where does your district stand on cognitive assessments capacity? Video | A high school student lost her ability to speak in an instant. Hear how she recovered. During the State of the Union, President Barack Obama made note of important improvements at the start of his address, "Tonight, after a breakthrough year for America, our economy is growing and creating jobs at the fastest pace since 1999. Our unemployment rate is now lower than it was before the financial crisis. More of our kids are graduating than ever before; more of our people are insured than ever before; we are as free from the grip of foreign oil as we've been in almost 30 years." The Senate Health, Education, Labor, and Pensions Committee held a hearing, "Fixing No Child Left Behind: Testing and Accountability." Last week Senate HELP Chairman Alexander released his 387 page ESEA reauthorization discussion draft, entitled "Every Child Ready for College or Career Act of 2015." On Dec. 15, 2014, The Federal Register published a notice inviting applications for new awards under the SPDG competition. The purpose of this program, which was authorized by the Individuals with Disabilities Education Act, is to assist State educational agencies in reforming and improving their systems for personnel preparation and professional development in early intervention, educational, and transition services in order to improve results for children with disabilities. For many readers, nothing compares with getting lost in a good book. But despite their desire to do so, many special needs students face challenges that make reading a pain instead of a pleasure. Not only are they locked out of the world of Harry Potter; they're also apt to be behind in their classes. "Most of school is reading, so many students with comprehension or expression problems — particularly those with dyslexia — are locked out," said Jennifer Topple, director of assistive technology at the Howard School on Atlanta's Westside. "The decoding part — sounding words out — is very difficult because their systems are not set up to do that smoothly." Nearly one in 10 American children under the age of 18 has some type of learning disability — a disorder that affects a child's ability to understand or use language, make mathematical calculations, maintain attention, and even coordinate body movements. Learning disabilities arise from neurological differences in brain structure and function. These differences, which often run in families, affect a person's ability to receive, store, process, retrieve or communicate information. In numerous schools, testing season is just beginning. Countless public schools administer districtwide assessments three times a year, and they administer federally-mandated yearly statewide testing during the spring season. Consequently, beginning in January and continuing until May, many students will engage in two districtwide assessments and one statewide assessment. For students with learning disabilities, this can be a time of frustration or a time of confidence. Family income appears to be a major factor influencing whether parents will seek mediation or due process in special education disputes with their child's school district. A nationwide survey of over 500 parents with children on the autism spectrum finds that families earning more than $100,000 a year are significantly more likely to pursue litigation compared to those with incomes that are half that level. The findings published recently in the Journal of Autism and Developmental Disorders may point to fundamental inequities in the special education process, researchers said. Education Secretary Arne Duncan spelled out his priorities for a new federal education law, calling on Congress to build in funding for preschool, add $1 billion annually in federal aid for schools with the neediest students, and maintain the federal mandate that says states must test students every year in math and reading. Duncan spoke at Seaton Elementary, a high-poverty school in the District's Shaw neighborhood. He was supposed to visit a classroom, but school was delayed by freezing rain and none of the mostly Latino and African American students were present. 2015 is going to be an exciting year for learning, across all segments. Experts predict this will primarily be due to the mind-blowing convergence between learning habits and technology use. Changes and development in technology will define the way we learn in future as the "ed tech" market is steadily growing — it's slated to become a $19 billion industry by 2018. A look at some key trends in the news will perhaps show where we are headed and how we should prepare our students for the future. Making sure school-aged kids get to sleep at a regular hour is often a struggle for parents. But a study by researchers at McGill University and the Douglas Mental Health University Institute in Montreal suggests it's well worth the effort: the researchers found that a good night's sleep is linked to better performance in math and languages — subjects that are powerful predictors of later learning and academic success. In findings published recently in the journal Sleep Medicine, the researchers reported that "sleep efficiency" is associated with higher academic performance in those key subjects. Sleep efficiency is a gauge of sleep quality that compares the amount of actual sleep time with the total time spent in bed. When presented with new material, standards and complicated topics, we need to be focused and calm as we approach our assignments. We can use brain breaks and focused-attention practices to positively impact our emotional states and learning. They refocus our neural circuitry with either stimulating or quieting practices that generate increased activity in the prefrontal cortex, where problem solving and emotional regulation occur. Stress about a meeting that is still a week away, handwringing before talking to the cashier in the grocery line, worrying about seeing an acquaintance on the street — for people with social anxiety disorder, even the simplest task can prove challenging. The symptoms of social anxiety often set in around adolescence, when people place a new emphasis on social interactions and their place in their peer groups. But some academics fear that greater access to technology could exacerbate social anxiety among teens, particularly as smartphones, tablets and computers become omnipresent in and out of the classroom. Art has long been recognized as an important part of a well-rounded education — but when it comes down to setting budget priorities, the arts rarely rise to the top. Many public schools saw their visual, performing and musical arts programs cut completely during the last recession, despite the many studies showing that exposure to the arts can help with academics too. A few schools are taking the research to heart, weaving the arts into everything they do and finding that the approach not only boosts academic achievement but also promotes creativity, self-confidence and school pride. The Obama administration required low-performing schools that got federal money intended to spur a turnaround to add time to their school day or school year. Years into the effort, however, school leaders who accepted federal millions say the added teaching time was only moderately helpful. Stepped up teaching, often resulting from teachers being given more time to collaborate, yields a much bigger payoff, they report.